Seen below is a photograph showing two views of a platinum engagement ring in which I've set princess cut sapphire. Like with many of the rings I make, this one shares much the same visual character as seen in a tension set ring, while being more secure as well as being able to be resized if the need should arise. 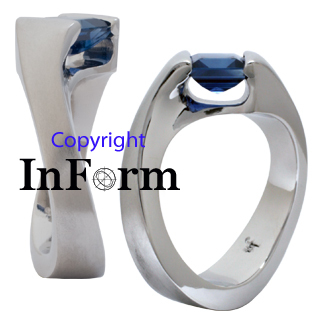 The overall ring is quite simple with the sapphire oriented above the finger at forty five degrees. A definite texture has been applied to the outermost surfaces of both the engagement and wedding rings to prevent those surfaces from so easily becoming scratched and worn..